Pets just make everything all right! 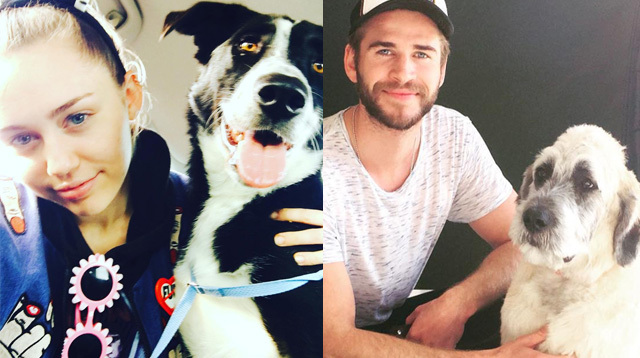 Actor Liam Hemsworth has adopted a new furry friend—and it's all thanks to his animal-loving ex fiancée Miley Cyrus. The singer is known for owning quite a lot of pets, and it seems like Liam turned to his ex for advice on where to find a suitable rescue dog to add to his family. The Hunger Games hunk was photographed crouching next to a large white pup in an Instagram post for Los Angeles' Wylder's Holistic Pet Center and Rescue and in the caption, a representative revealed the new friends were set up by Miley herself. "Thanks @mileycyrus for loving dogs as much as we do!!" an employee writes. "You helped find this gigantic, 6-month-old puppy a new home. @liamhemsworth you will give this deserving baby a great life!" Meanwhile, Miley also helped her rocker pal Wayne Coyne find a new member for his family on Sunday, when they attended an adoption drive in California, which was hosted by bosses at The Bella Foundation. The “Wrecking Ball” pop star introduced fans to young Yogi in a series of snaps on Instagram, revealing the pup would be a new pal for her pooch, named Milky. "Yogiiii!" she exclaimed. "Adopted from da @thebellafoundation !!!!! Family dawggg! Fwend for Milky So when Milk comes 2 visit @waynecoyne5 (and his girlfriend) @katyweaver w (with) me she has a bestie!!!" Liam recently opened up about his broken engagement to Miley, insisting the singer will always have a special place in his heart. The pair met and fell in love on the set of their romantic drama The Last Song in 2009 and became engaged in 2012, but the relationship didn't last and they parted ways in September 2013. "You fall in love with who you fall in love with," the 25-year-old actor told Men's Fitness magazine about their headline-grabbing romance. "You can never choose. I guess some people just come with a little more baggage." "I mean, look—we were together five years," he continued. "So I don't think those feelings will ever change. And that's good because that proves to me that it was real. It wasn't just a fling. It really was an important part of my life and always will be."